The project is located at Phu Thu, Kinh Mon, Hai Duong, Vietnam. 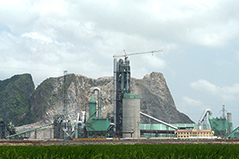 Phuc Son Cement Plant in Vietnam is invested by Taiwan Lucky Cement Co.,Ltd, and it was completed and started production on May 17,2005, and the output of clinker is stablely holding at about 5500TPD. This is the first overseas 5000TPD cement production line project which is contracted, designed, inspected and tested in accordance with Chinese standard with Chinese equipment mainly used. It’s a milestone for Chinese cement industry to enter the overseas market. In April 2008, our company was awarded the contract of Phuc Son Cement Corporation Line-2 5000TPD Clinker Production Line Project.